The definition of Usability, according to the Oxford Learners Dictionary is “the quality of being easy to use”. Lately, usability got a new boost from the exponential development of the digital world: websites, softwares, online softwares, applications, cloud-based tools, etc. “Easy to use” is becoming one of the most important criteria for the success of a digital product. Along with this new interest for usability emerged methods and techniques to design, improve, and test it. Here, we focus on the testing part. Where the generally accepted definition for “unmoderated” is “not monitored for inappropriate content, time wasting, or bad language”, it has a slightly different acceptance in the User Testing realm. It means “not monitored” indeed, which suggests that there is no moderator involved in the test. The test participant does the test on her own. “That you can connect to from far away, using an electronic link”, according to the Oxford Learners Dictionary. The test can be performed remotely on a computer. The test participant does not have to go to a specific location to perform the test. “The extent to which a product can be used by specified users to achieve specified goals with effectiveness, efficiency and satisfaction in specified context of use.” (ISO standard definition) It is especially important to understand that it’s not necessarily a problem if a product is difficult to use as long as it is easy to learn, and that satisfaction is also part of usability. If you succeed in doing the assigned task with the product but the experience of it is disastrous, it means also that the usability is bad. Usability can be planned and described, it can be designed. But it also has to be tested. You won’t ever be able to establish the usability of a product if you don’t test it. Many methods have been created over the years to test usability. The traditional method to test usability is the “In-person lab-based usability testing”. URUT is a simpler way to get quick and focused insights on the usability of a product. And what is a “moderated test” then? A test is moderated when a moderator is present during the test. The test can still be performed remotely. The configuration will then be similar to a conference call or a skype call. The moderator and the test participant are able to talk to each other while performing the test. Typically the moderator’s role is to accompany the participants, tell them what to do, make them feel comfortable, get them to verbalize their thoughts and keep them talking. 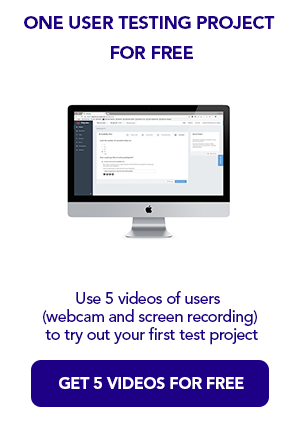 This post is the first one of a series about Usability Testing. I’ll be posting the next one soon, if you don’t want to miss them, sign up for our newsletter (sent once a month usually).